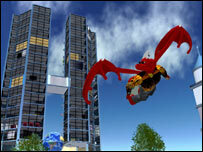 SL Mascot: Why do TV documentaries always show flying avatars? Why do TV documentaries always show flying avatars? 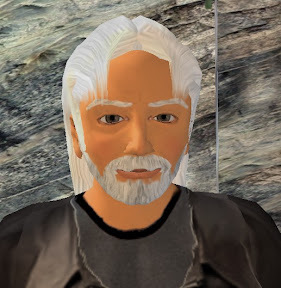 Following the BBC Newsnight piece about Second Life on Wednesday night, I started thinking about how SL is portrayed in the media, and how this impacts on how SL is perceived in business. This is a pity, as some of the more useful concepts in SL are the ability to interact with people regardless of location; the ability to interact with 3D objects; the new ways of presenting information.... the list goes on. Instead of just flying over anonymous buildings in SL, why not visit the Cybrary and see how librarians from around the world are getting together to share ideas? Or visit one of Aimee Webber's beautifully rendered locations; Or show one of the science exhibits that allows you to climb around a caffeine molecule? Next time I'm in SL I will take some photos to brighten up this post!.